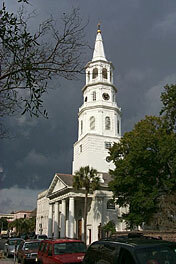 Charleston SC, founded in 1670, is one of America's oldest cities. She played an important role in the American Revolution and was the site of the Secession Convention that in 1861 dissolved the Union, which eventually lead to the The War Between the States. This site is all about the development of Charleston, South Carolina. 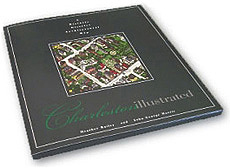 The highlight of the site is Charleston Illustrated, an architectural map of the downtown historic districts. We've also added pages containing original and antique maps, links to books, and information about local sights and businesses. 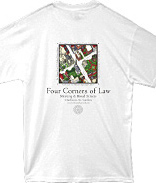 Detail of the "Four Corners of Law" on Charleston Illustrated. View of St.Michael's Church before a summer rainstorm. The Big Map - What is Charleston Illustrated and where to get it. Maps&Legends - Maps showing original and antique maps of the development of Charleston. Book&Such - Books on the city, it's architecture, food. The City Today - Businesses and attractions. About Us - The authors and a bit about what we do when we aren't drawing Charleston.